Art Sqool sucked me in early on. My second in-game assignment was to draw slowly and deliberately. It was a tall order for drawing with a mouse, but I gave it a fair shot. I made sure I traced my lines slowly, with purpose, really considering each stroke and what it added or took away. As I kept drawing, I realised how much I was losing myself in the process of making art. The gorgeous scenery is what first attracted me to this game. Glander’s previous game, Lovely Weather We’re Having, was a pleasant stroll through an alien neighbourhood of bright, bulbous flora and fauna. 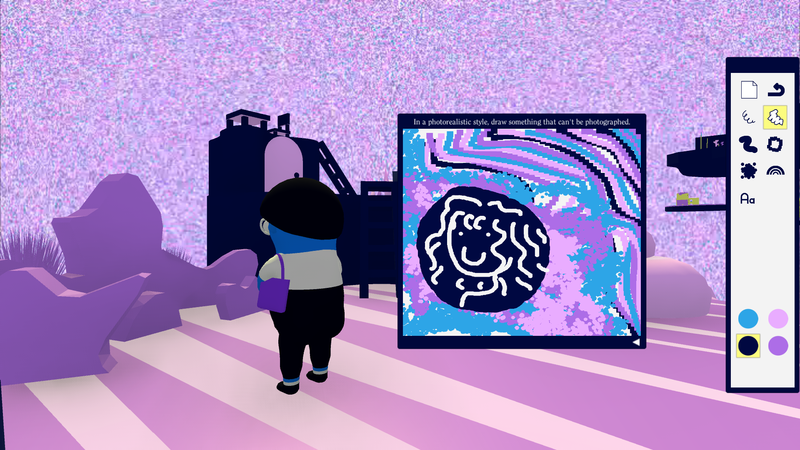 That aesthetic returns in Art Sqool, where I amused myself by looking for the hidden frog faces in the architecture while I grabbed a new colour swatch. The drawing assignments are what makes Art Sqool special. I used to make art; specifically, I made experimental videos at university during my cinema studies degree. I had thought I might be an artist, then decided instead that I wanted to be a museum curator, and now I am a journalist. It’s been a long time since I flexed my artistic muscles, so I wanted to take the assignments in this game seriously. The game eases you into this with some humour. The first assignment is to draw a perfect circle with your non-dominant hand, which I know is an actual first year art school assignment that some of my friends have had to master. It’s hard to maintain that cynicism about art when playing Art Sqool. I know some people will spend time drawing dicks in this game, and the game’s sly humour is not unwelcome to players’ flights of fancy in that regard. Whenever you get graded, you’ll never receive an explanation for why you’re getting a B or a C or an A, just a bar graph charting your “approach” and “colour,” among other criteria. After making a half dozen drawings, I just started drawing for the pleasure of drawing. Once I had completed fifteen of the fifty assignments, I felt like I’d tapped into a new avenue for appreciating art, one in which I could experience the joy of making a mark on a canvas myself.